I was thinking about Frida Kahlo I just was thinking you might like to go the museum. Poppy got me years ago a little painting of Frida and she went to see the film which I didn’t. poppy came from her long day of filming. I spent hours over a hot gas cooker and hurray dishes came out really well Good old cottage pie with a twist and 150 year old recipe for old fashioned rice pudding with a nutmeg skin. I had my hair washed and blown by Mustapha who I think does not like me. he is so angry anyway so on with my conquest of just being kind and kind till I kill him with kindness he angrily told me his daughter is Not Going To Be A Hairdresser. It must be quite remarkable to see New York now I have not been since the 80s and it was so quirky and I enjoyed looking at strange shops I hear mostly gone. I am getting another hot water bottle as it has gone cold. It can be unbearably cold in New York. My friend offered me her fur coat but Green person that I was I declined and could not deal with icy New York and all these women with their lovely fur coats on I ended up round a brazier with the poor people haha. Timidly trying to engage with Christmas. Found a birthday card in letter holder that I had not sent last year. It is on its way now. I am working my way through the alphabet. Address books are small books of little stories aren’t they. I look now at in brackets (now dead) on a lot of them. My phone battery keeps packing up. I went in search of a Christmas tree in Tottenham but the size I wanted was sold out it had to go in pull along shopping basket. I tell Poppy that she is loved and l will always come to her but Chislehurst gives me hay fever. I bought a stollen cake which is for Christmas but it is really for me. Marzipan is magical for me. My Christmas tree looks awful the lights keep going on the blink and batteries failing which sums up a reflection of oneself. please just read a book and listen to music and stop going on the computer try getting disconnected like me I have 95 unread e mails and thankfully can’t figure out Facebook. This is a long electric letter again. Did you know that Carly Simon almost slept with Sean Connery but her sister pipped her to the post haha. Wish I had slept with Sean Connery instead of some of the stoats I did sleep with. I have been put forward for a job hurray my first job of the year from Ugly. 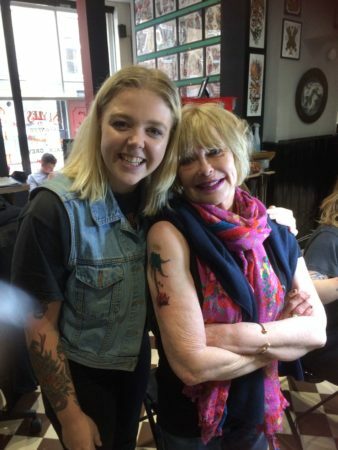 I am to go and get a tattoo done in shoreditch for a new campaign for older people who want to do new and exciting things like getting a tattoo sadly there does not appear to be a sheep. The front door colour is ghastly and I have broken it to Tungie (builder) also the spy hole is to high for me I cannot due to shrinkage see out of it but filling in the hole costs more money to fill in and when I have gone to heaven the next owners may want it. You have disturbed memories for me. I was friends with the duke of Bedford’s son and went one weekend to his parents house & reading about this ancient pile brought back memories. they had a minstrel gallery and his mum had a dolls house that was almost the size of my bedroom. he was lovely but married a person of colour which upset his parents. It ended badly. “…Address books are small books of little stories aren’t they…” You can’t say that about an expensive Xphone contact list. “…sadly there does not appear to be a sheep.” Great opening line for a novel. P.S. a little age stereotyping here…”mad as an old man’s trousers..”. Can you make this a regular feature please? Or perhaps an irregular feature would be more fitting. Regarding the phrase: “As mad as an old man’s trousers”, I am reminded of a picture of the composer Ralph Vaughan Williams. His trouser waistband is just under his armpits. The caption to this picture, which was in an issue of ‘Viz’, was: “Never mind about ‘The Lark Ascending’, this is his new work – ‘The Waistband Ascending’. I found myself nodding madly all through this post. She must be one of the sanest people on the planet. Too bad about the sheep. ‘small cold winds coming through ancient windows but sun out hurray!’ What a splendid way to finish. I do enjoy your irregular Maggie messages. I do agree with Maggie about address books. I found an old one the other day, and flicked through it. About half way through, I had to put it down, having ‘got something in my eyes’ and having the distinct feeling that I was too far from the living, but worryingly close to the dead. Even an address book of mine has scratched out entries, often with a terse note underneath, that record things like: ‘Accidental drug overdose, 1996’. ‘Moved to Riga, Latvia’. ‘Deceased, 1993’. One just had the word ‘Gone’ under it. Address books must have more stories than Scheherezade, and mostly not a fun read. Ian, I can think of nothing sadder than a collection of old address books. I have my mother’s and since she was 98 when she died you can imagine how many of hers were crossed out. I have a friend who had to start a new book in the late 80s when he realised that over 50% of the old entries had been crossed out. I just received the envelope from my clipping service (the same friend as above) and included is an advert for a needlework cushion cover showing an Australian lamb – which the owners called Lamington. For those not familiar with Australian delicacies look it up and laugh at the perfection of the name. Am thinking of ordering the kit.